"Q-number" redirects here. For the Q-theory concept, see Q-analog. Single electron orbitals for hydrogen-like atoms with quantum numbers n = 1, 2, 3 (blocks), ℓ (rows) and m (columns). The spin s is not visible, because it has no spatial dependence. Quantum numbers describe values of conserved quantities in the dynamics of a quantum system. In the case of electrons, the quantum numbers can be defined as "the sets of numerical values which give acceptable solutions to the Schrödinger wave equation for the hydrogen atom". An important aspect of quantum mechanics is the quantization of the observable quantities, since quantum numbers are discrete sets of integers or half-integers, although they could approach infinity in some cases. This distinguishes quantum mechanics from classical mechanics where the values that characterize the system such as mass, charge, or momentum, range continuously. Quantum numbers often describe specifically the energy levels of electrons in atoms, but other possibilities include angular momentum, spin, etc. An important family is flavour quantum numbers – internal quantum numbers which determine the type of a particle and its interactions with other particles through the forces. Any quantum system can have one or more quantum numbers; it is thus difficult to list all possible quantum numbers. 1 How many quantum numbers exist? How many quantum numbers exist? The question of how many quantum numbers are needed to describe any given system has no universal answer. Hence for each system one must find the answer for a full analysis of the system. A quantized system requires at least one quantum number. The dynamics of any quantum system are described by a quantum Hamiltonian, H. There is one quantum number of the system corresponding to the energy, that is to say the eigenvalue of the Hamiltonian. There is also one quantum number for each operator O that commutes with the Hamiltonian. These are all the quantum numbers that the system can have. Note that the operators O defining the quantum numbers should be independent of each other. Often, there is more than one way to choose a set of independent operators. Consequently, in different situations different sets of quantum numbers may be used for the description of the same system. The spin-orbital interaction, however, relates these numbers. Thus, a complete description of the system can be given with fewer quantum numbers, if orthogonal choices are made for these basis vectors. Many different models have been proposed throughout the history of quantum mechanics, but the most prominent system of nomenclature spawned from the Hund-Mulliken molecular orbital theory of Friedrich Hund, Robert S. Mulliken, and contributions from Schrödinger, Slater and John Lennard-Jones. This system of nomenclature incorporated Bohr energy levels, Hund-Mulliken orbital theory, and observations on electron spin based on spectroscopy and Hund's rules. This model describes electrons using four quantum numbers, n, ℓ, mℓ, ms, given below. It is also the common nomenclature in the classical description of nuclear particle states (e.g. protons and neutrons). A quantum description of molecular orbitals require different quantum numbers, because the Hamiltonian and its symmetries are quite different. For example, in caesium (Cs), the outermost valence electron is in the shell with energy level 6, so an electron in caesium can have an n value from 1 to 6. For particles in a time-independent potential (see Schrödinger equation), it also labels the nth eigenvalue of Hamiltonian (H), that is the energy, E with the contribution due to angular momentum (the term involving J2) left out. This number therefore has a dependence only on the distance between the electron and the nucleus (i.e., the radial coordinate, r). The average distance increases with n, and hence quantum states with different principal quantum numbers are said to belong to different shells. A quantum number beginning in n = 3,ℓ = 0, describes an electron in the s orbital of the third electron shell of an atom. In chemistry, this quantum number is very important, since it specifies the shape of an atomic orbital and strongly influences chemical bonds and bond angles. The values of mℓ range from −ℓ to ℓ, with integer intervals: The s subshell (ℓ = 0) contains only one orbital, and therefore the mℓ of an electron in an s orbital will always be 0. 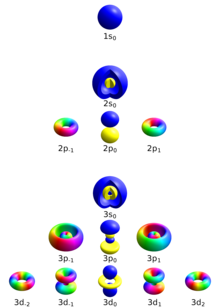 The p subshell (ℓ = 1) contains three orbitals (in some systems, depicted as three "dumbbell-shaped" clouds), so the mℓ of an electron in a p orbital will be −1, 0, or 1. The d subshell (ℓ = 2) contains five orbitals, with mℓ values of −2, −1, 0, 1, and 2.
ms = −s, −s + 1, −s + 2, ..., s − 2, s − 1, s.
An electron has spin number s = 1/2, consequently ms will be ±1/2, referring to "spin up" and "spin down" states. Each electron in any individual orbital must have different quantum numbers because of the Pauli exclusion principle, therefore an orbital never contains more than two electrons. Note that there is no universal fixed value for mℓ and ms values. Rather, the mℓ and ms values are random. The only requirement is that the naming schematic used within a particular set of calculations or descriptions must be consistent (e.g. the orbital occupied by the first electron in a p orbital could be described as mℓ = −1 or mℓ = 0 or mℓ = 1, but the mℓ value of the next unpaired electron in that orbital must be different; yet, the mℓ assigned to electrons in other orbitals again can be mℓ = −1 or mℓ = 0 or mℓ = 1). Example: The quantum numbers used to refer to the outermost valence electrons of a carbon (C) atom, which are located in the 2p atomic orbital, are; n = 2 (2nd electron shell), ℓ = 1 (p orbital subshell), mℓ = 1, 0, −1, ms = 1/2 (parallel spins). Results from spectroscopy indicated that up to two electrons can occupy a single orbital. However two electrons can never have the same exact quantum state nor the same set of quantum numbers according to Hund's rules, which addresses the Pauli exclusion principle. A fourth quantum number with two possible values was added as an ad hoc assumption to resolve the conflict; this supposition could later be explained in detail by relativistic quantum mechanics and from the results of the renowned Stern–Gerlach experiment. The reason for the unusual fluctuations in I, even by differences of just one nucleon, are due to the odd and even numbers of protons and neutrons – pairs of nucleons have a total angular momentum of zero (just like electrons in orbitals), leaving an odd or even number of unpaired nucleons. The property of nuclear spin is an important factor for the operation of NMR spectroscopy in organic chemistry, and MRI in nuclear medicine, due to the nuclear magnetic moment interacting with an external magnetic field. For a more complete description of the quantum states of elementary particles, see Standard model and Flavour (particle physics). Elementary particles contain many quantum numbers which are usually said to be intrinsic to them. However, it should be understood that the elementary particles are quantum states of the standard model of particle physics, and hence the quantum numbers of these particles bear the same relation to the Hamiltonian of this model as the quantum numbers of the Bohr atom does to its Hamiltonian. In other words, each quantum number denotes a symmetry of the problem. It is more useful in quantum field theory to distinguish between spacetime and internal symmetries. A minor but often confusing point is as follows: most conserved quantum numbers are additive, so in an elementary particle reaction, the sum of the quantum numbers should be the same before and after the reaction. However, some, usually called a parity, are multiplicative; i.e., their product is conserved. All multiplicative quantum numbers belong to a symmetry (like parity) in which applying the symmetry transformation twice is equivalent to doing nothing (involution). Dirac, Paul A.M. (1982). Principles of quantum mechanics. Oxford University Press. ISBN 0-19-852011-5. Halzen, Francis & Martin, Alan D. (1984). QUARKS AND LEPTONS: An Introductory Course in Modern Particle Physics. John Wiley & Sons. ISBN 0-471-88741-2. This page was last edited on 20 April 2019, at 19:10 (UTC).